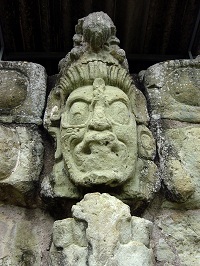 Compared to day-signs and trecenas, little is known about the Mayan Lords of the Night…not even their Mayan names. We do know that they were a group of nine gods of the underworld. We also know that the Lords of the Night played a role in the Mayan Calendar and in Mayan Astrology. The Mayan Calendar is broken down into groups of 9 days, with each day ruled by one of the Lords of the Night. We don't know whether the Lords ruled the daylight hours or the nighttime hours. We don't know exactly how the Lords of the Night were used in Mayan Astrology. Since the Lords of the Night ruled the underworld and were deities that souls had to pass by to achieve “heaven”, I believe it's safe to interpret the Lords of the Night as representing our subconscious and the dark parts of our personality that we prefer remain hidden. I also believe we can assume that they were applied similarly to how gods were assigned to day-signs, i.e., applied in a specific, repeating pattern that provided additional insight into personalities. Thus, if you were born on a day ruled by the first Lord of the Night, the qualities of that Lord would influence your subconscious and instinctual/primitive behavior. To me, it's like Dr. Jekyll and Mr. Hyde. Your day-sign is Dr. Jekyll – the good one. Your Lord of the Night sign is Mr. Hyde – the part that you keep hidden. It's possible that in order to understand the Lords of the Night more, we have to look at their Aztec counterparts, of whom we know quite a bit. The Aztec Lords are also a group of nine gods of the underworld, and they appear to follow the same order as the Mayan Lords. This would allow us to create a chart for how the Mayan Lords of the Night apply to Mayan Astrology, similar to the charts we have for day-signs and trecenas. Such a study is too complex for this article at this time, but it's certainly something to think about.